The last month has been cra-cra-crazy with school and life! Last week was parent teacher conferences, 50's day, Halloween, and a trip to a NASCAR race!!!! That was just one week so you can imagine the last month! I am very happy to announce that the winner of my giveaway is Julie@Lattes & Laughter! She will be receiving two gift cards because it has taken me sooooooooo long to announce the winner! Lucky for her she will have twice the fun at the at the container store:) Check our her cute blog and wish her a happy late birthday! Monday kicked off with parent teacher conferences, and Tuesday I got up a little earlier to get ready for the 50th day of school! Celebrating 50th day of school with my class was and co-workers was so stinkin fun!!! My husband took this pic as I was running walking out the door and sent it to everyone! All of our elementary school dressed in 50's clothes and there were poodle skirts, scarfs, letterman jackets, pony tails, head bands, greased hair, leather jackets, and sun glasses everywhere! My class along with many others made coke floats, had hula hoop contest, and dance to 50's music! My inspiration began with Cara Carroll's 50th Day Mini Unit and grew into a school wide event! We wrote about how to make coke floats, made a 50's word wall, and a doubles cart that ended with 25+25=50 and 50+50=100! We also made a books of all the different ways to represent 50 along and it was a day to remember! We are over halfway to our 100th day celebration! Any ideas for the 100th day of school? After a fun filled 50's day, we celebrated HALLOWEEN! We can only observce two Holidays a year with a classroom party and Halloween is not one of the days but we found plenty of ways to incorporate Halloween into our learning activities! 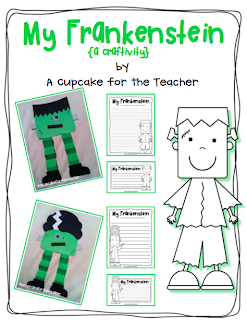 This is a picure of our Frakenstein activities inspried from Teri at A Cupcake for the Teacher's Frakenstien Craftivity! I bought the mask at Marshalls and painted it before spraying a light coat of silver spray paint. The green Frakenstein shirt you see in the background came from Kirklands and it really a chair cover! The past 3 weeks I have had a teacher cadett from our high school coming to observe and one of her task was to create a bulletin board. I gave her the frakenstein chair cover and she came up with the phrase "Mrs. Livers' Class if Frankly Spooktacular". I wanted to show you the full display but for some reason the picture will not download onto my page:( I think it is awesome that students can attend a class in high school and have the opportunity to observe, create projects, and teach a few lessons before going off to college! What a way to have an opportunity to discover your passion before enrolling in your first college class! Needless to say I was drinking a few extra cups of coffee to get through Thursday and Friday! Currently I am hooked on Starbucks pumpkin spice latte but I found dunkin donuts pumpkin spice coffee grounds and pumpkin spice creamer at wal-mart for Mr. Liver to make in the mornings! (He makes breakfast due to my early mornings in the classoom) This is a fabulous way to start your mornings especially this last week with all its craziness! You would think I would spend the weekend vegging out and relaxing but instead I took a family trip to the Texas Motor Speedway for some NASCAR fun! The last time I attended a race or followed a race was high school but the fan inside of me emerged and was excited to hear "Gentlemen Start Your Engines!" I grew up a Jeff Gordan fan so Mr. Livers and I had to represent but unfortunately it didnt bring the #24 a win. Amanda at Teacher Maddeness is fellow NASCAR fan and I really wanted to be the good luck charm for our favorite driver but maybe next time! By the way, I would like to give Amanda a shout out for reaching 1,000 followers and she only started blogging in June! Congrats! The fun conintues with election day and I am excited to hold a mock election with my students! Have a fabulous week! I love your 50s outfit! I so could have lived in that decade. :) Hope you had fun on Sunday...I thought for a while there that our guy was going to pull off a win for you! I'll be at the game on Saturday - not gonna lie...I'm nervous about it - your Razorbacks are always a tough match up!